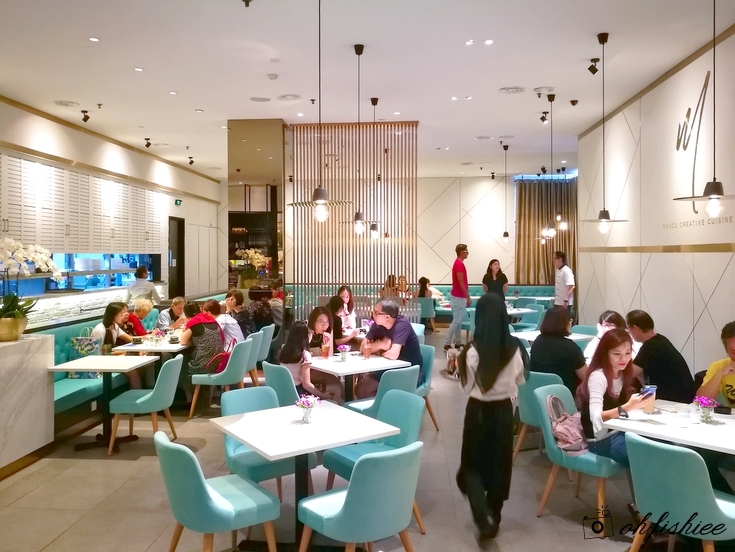 If you do not already know, MARCO is the newest establishment at the Ground Floor, Old Wing of 1 Utama shopping mall. Located near TGIFriday's and Pappa Rich, surely you'd notice the vibrant gold shopfront if you pass by this area. What excites the patrons of the mall is the huge aquarium display in front of MARCO. Guess what's inside? Not the ordinary fish, but it's jellyfish! I am sure it is not something you commonly see in a mall, and truly the jellyfish display is so beautiful that you have to stop by and just admire this lovely sea creature! Excellent decor and ambiance aside, now let's check out what's on MARCO's menu (Available during lunch and dinner). Unlike common fine dining that is expensive and time-consuming, MARCO offers a multicourse creative cuisine at only RM78+ per person and served in 50 minutes. 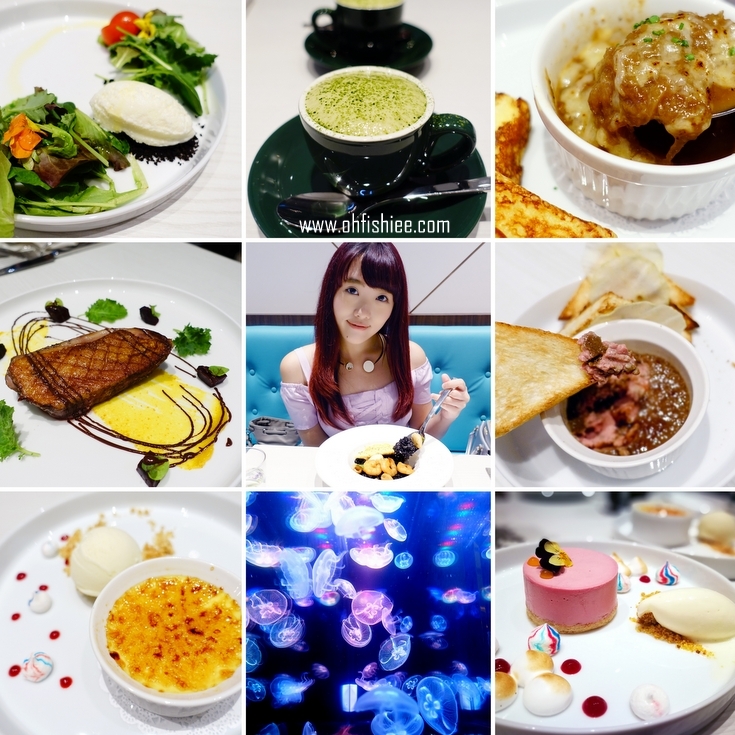 For this 7-course meal, except for the palate cleanser and appetiser which has already been set by the chef, you can choose among 3-6 options for the remaining 5 courses. The menu, invented by Chef-owner Daren Leong, is a culmination of Chef Daren's endless experiments with flavours and textures of food. 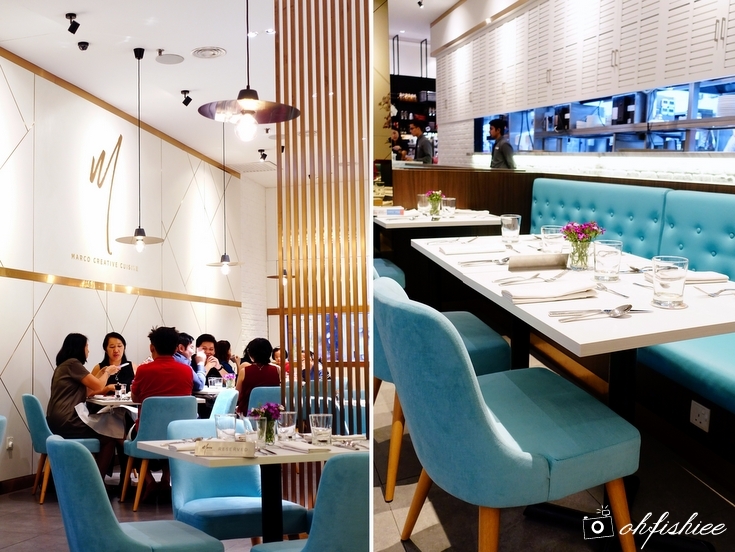 To complement this up-scaled culinary journey, the 62-seater restaurant is tastefully designed with tiffany blue and white theme to exude a sense of class and elegance. 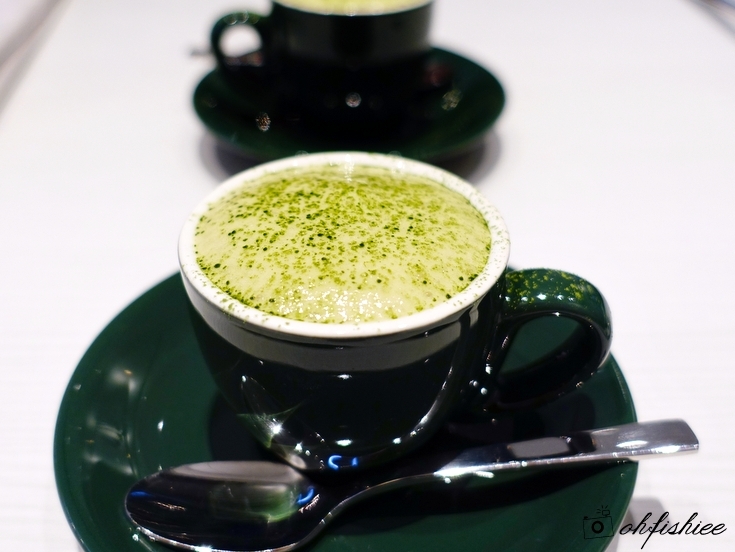 We begin our gastronomical journey with the palate cleanser - a smooth concoction of chilled lime snow, topped with tangy lime foam and matcha powder. So cool and refreshing to wake up all our senses and get our palate ready for the next dishes. After whetting the palate with something tangy, here comes the appetizer - an airy choux pastry filled with smoky aubergine caviar dip. If you enjoy something heavy in taste with an added twist of spicy flavour, this is something you'd love. Moving on to the soup, the staff recommends us the cold Strawberry Gazpacho which is a classic Spanish chilled vegetable soup but none of us is a fan of strawberry. So we decide to opt for the piping hot creamy mushroom soup instead. The overall taste of Truffled Mushroom Soup may seem overly earthy for some, but I personally love it because of its deep earthy flavours. 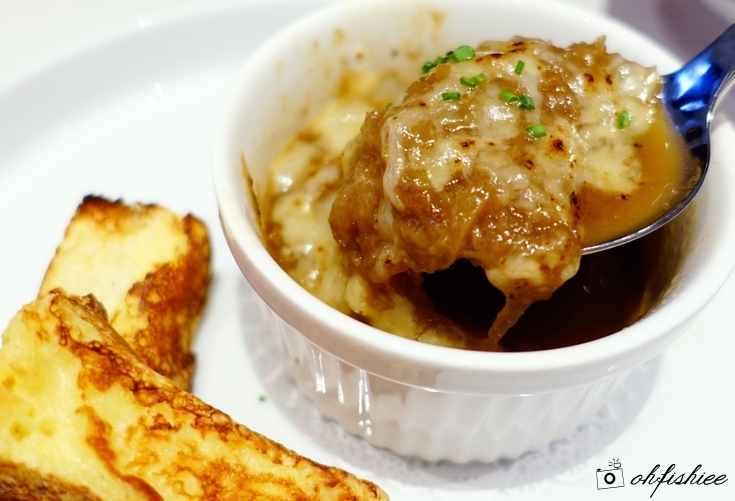 If you prefer something not so common, do try the caramelised French Onion Soup. It is wonderfully topped with a thick layer of gooey, melty cheese which tastes amazing once we stir it into the rest of the soup. 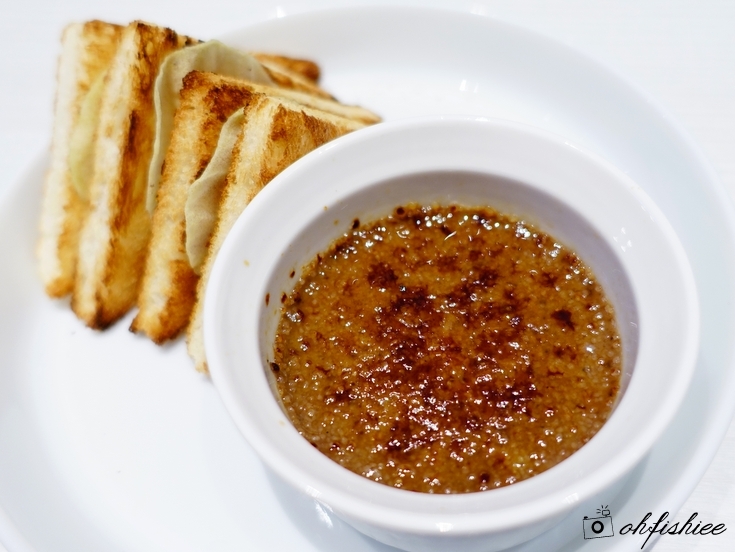 We appreciate how the chef boils it slowly for over 5 hours to achieve the ultra concentrated texture and natural sweetness in the onion soup. The French Toast is a bonus, but the soup is already thick, filling, and incredibly tasty on its own. 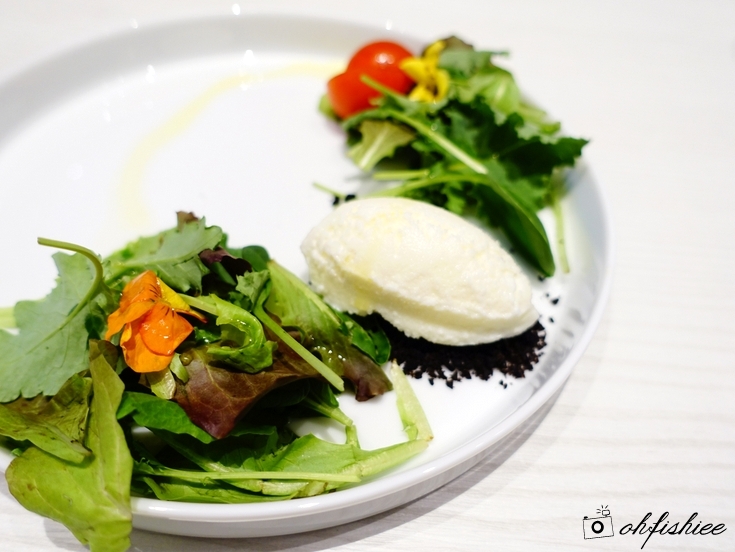 While we are allowed to choose from two types of salad and one chicken liver pate for the entree, we go for the most unique one among all - Savoury Ice Cream Salad - which features a large dollop of ice cream made from sea salt and skimmed milk. Accompanied with lots of greens, this is a great option for the healthy goers. 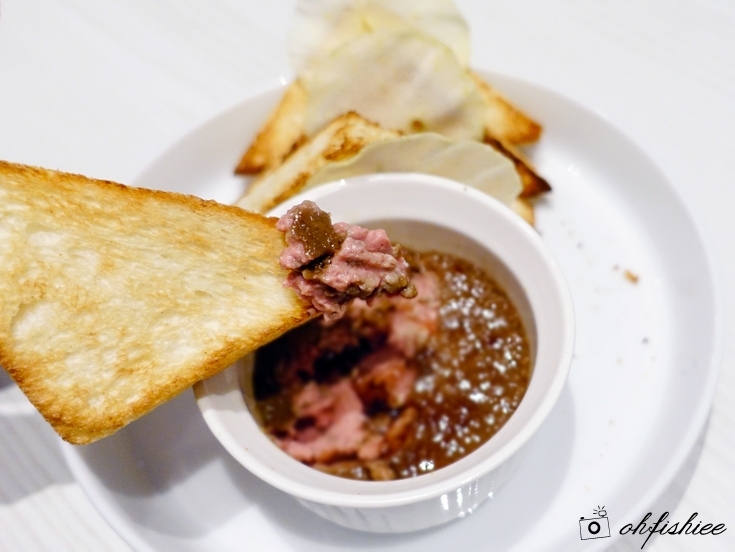 My dining partner prefers a more filling entree, and hence chooses the rich and decadent Chicken-Liver Pâté paired with toasted bread and crisp apple chips. I personally love the creamy liver pâté which makes a good spread for sandwiches, toasts etc. Its rich savoury taste is simply delicious and does not smell "metallic" at all. Food continues to arrive at our table while our stomach is already half-filled. 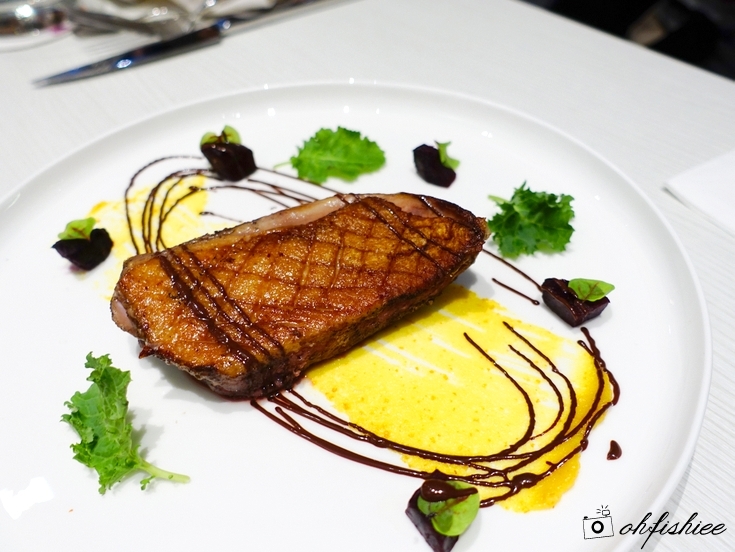 Daren's most notable main dish, the Duck Breast with Orange Puree and Roasted Beetroot, is a nice variation from the usual Cantonese roast duck. Prepared using the sous vide method, the meat is more tender than usual. Accompanied with Naval orange and 66% dark chocolate sauce, the resulting flavour is a complex burst of sour, bitter and sweet notes for the taste buds to explore. 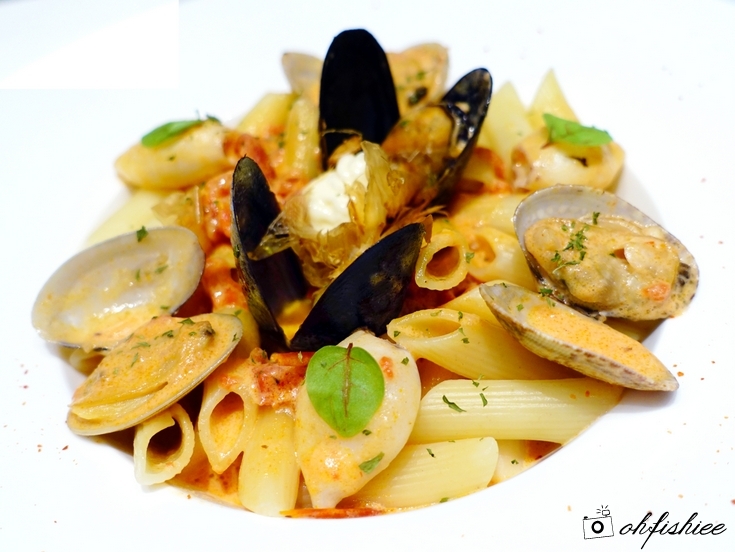 We also sample the pasta for our main course and are totally smitten by the simple yet tummy-comforting plate of seafood pasta coated with sweet and rich tomato-based cream. A more generous helping of sauce would be great for richer flavours in every mouthful. 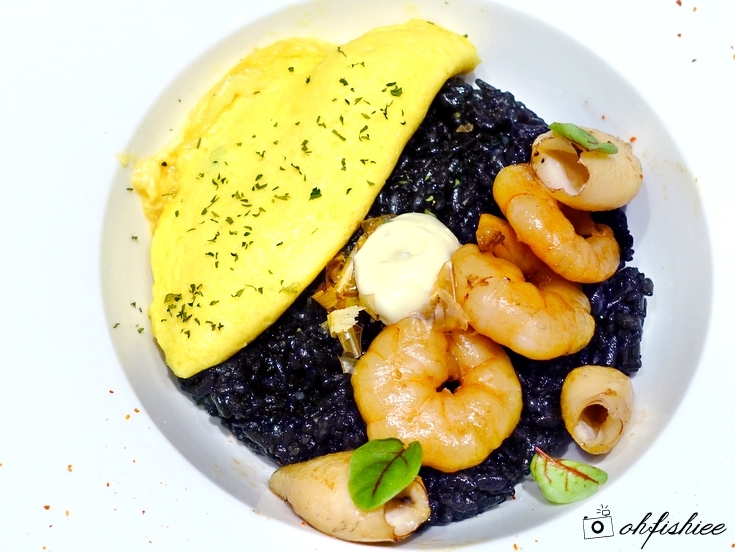 Another highly recommended main is the Squid Ink Japonica Rice, which is my personal favourite as well. Coated with squid ink, the texture of Japanese rice is slightly sticky, reminding me of sushi rice. Taste wise, the rice is flavourful on its own, and the portion is rather huge for one. omelette, it reveals a custardy cascade of soft-cooked egg curds. So creamy, smooth and gooey! Besides, other main course choices such as Chicken Roulade with Brussels Sprouts, Salmon with Jet Black Hollandaise and Vegetarian Arrabbiata are available too. The second last course certainly brings us on sugar high! 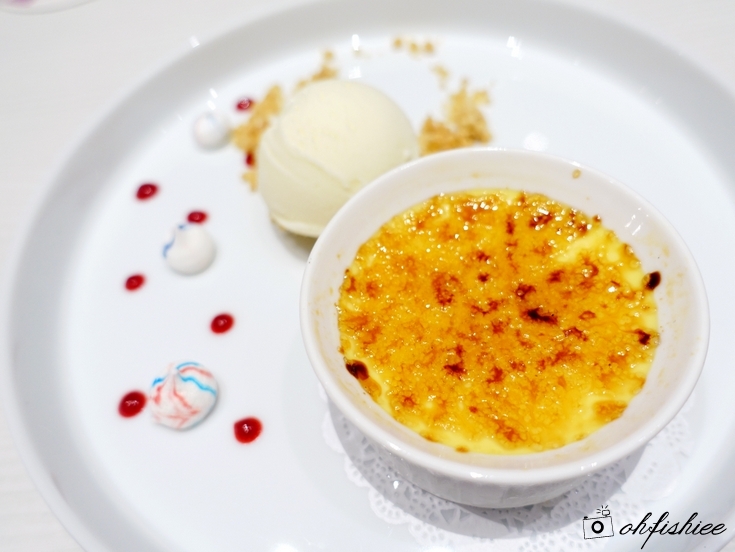 The classic Crème Brûlée is done perfectly well in the traditional way, achieving the sweet glorious gooey texture of egg custard that we enjoy. 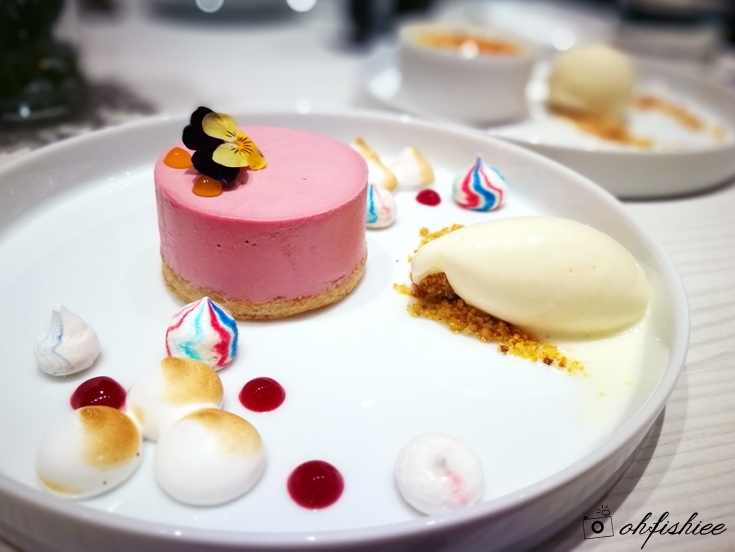 Fans of berries may go for the creamy raspberry mousse-like cheesecake as it is bursting with refreshing tang in contrast to the very slight sweetness. 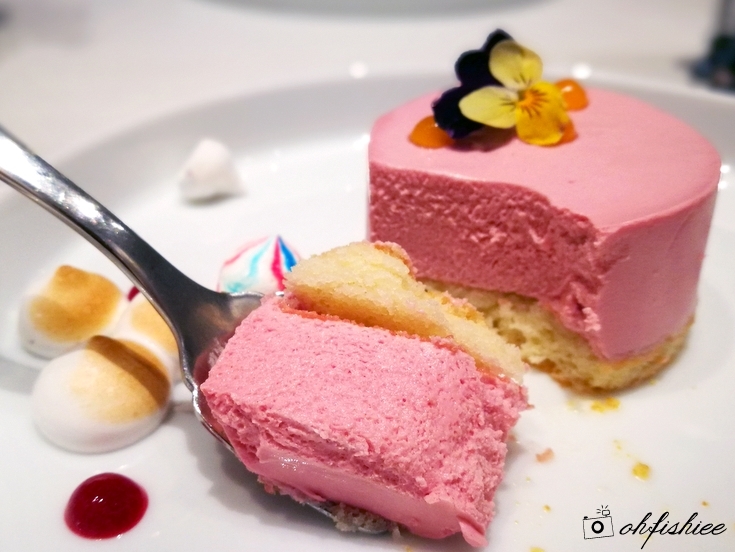 However, if you have slightly sweeter tooth, then the Deconstructed Lemon Meringue Pie would be a great option for you to indulge in the sweet concoction of soft lemon curd, passion fruit gel, Italian meringue and white chocolate sherbet. After ending the meal with a sweet note, drinks are served last. 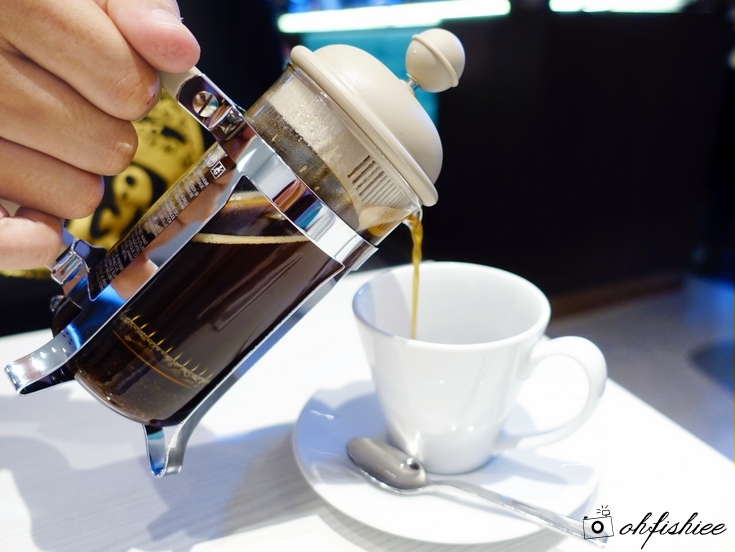 Among the 3 options of handcrafted coffee, loose leaves tea and sparkling berry, my personal favourite is the French Press coffee as it washes down the palate with a slightly acidic finish. Price includes 6% GST and excludes 10% service charge. The menu we sample here is seasonal and subject to change every 3-6 months. Perhaps during our next visit, Chef Daren may bring us more surprises and treat us with a myriad of flavours and textures? Can't wait to come back for more! 1. 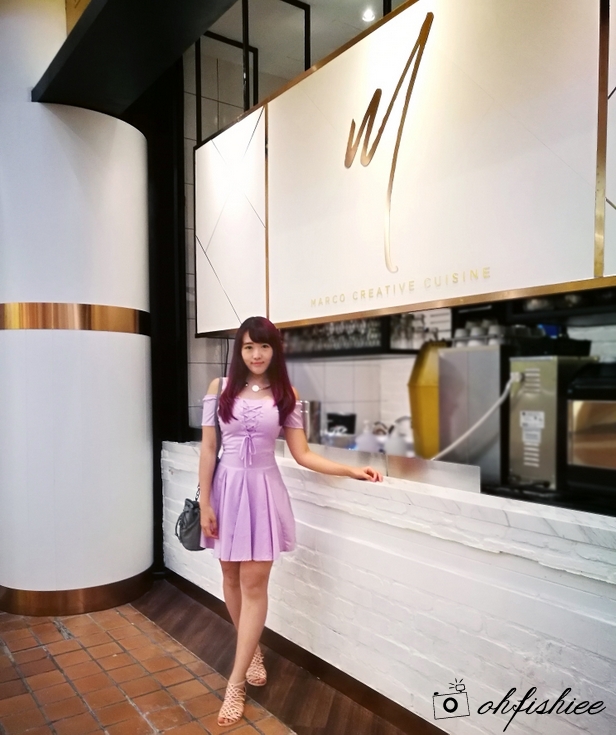 The fine dining concept in Marco Creative Cuisine is a great approach for more people to actually enjoy the experience of "fine dining" without burning a hole in the pocket. Click "Subscribe", as well as your zoosk register is finished. Zoosk Login as do everyday drawings for visiting as well as completing.